KALAMAZOO, MI — When senior pastors Jeff and Beth Jones led Valley Family Church (VFC) into a $12 million building campaign to ease their facility’s overcrowding, they had no idea they’d be building during a serious economic downturn. Despite those challenges, VFC celebrated the grand opening of their new building recently with facility-wide integration of their lighting systems through ETC’s Unison Paradigm architectural product line, Sensor+ dimming and control consoles. “We are a non-denominational charismatic family church using technology to help reach a sight-and-sound generation,” said Jeff Jones, noting the importance of how the lighting would be controlled. LD Todd Kenter of TheatArch Design Solutions, LLC in Fruitport, Mich. came up with a fully-integrated lighting system that would meet Michigan’s energy code. “By integrating the systems, the church achieves better overall control of the building,” Kenter said. “They have the capability to manually control the system from the security office — override the time clocks, force the building on in the case of an emergency, etc. They can control what lights are on, when they are on, and for how long. “When the cleaning crew goes into a space to clean it, the local control station buttons provide them a way to force on the lights in that space, but after a predetermined time, the lights go back to their original levels,” Kenter added. Preventing the waste of power isn’t the only advantage of the new ETC lighting system. “At 6:30 a.m., a working level of light illuminates the pathways to the office areas throughout the building for the staff so they never walk into a dark space,” Kenter said. System-wide integration also pays off for Valley Family’s large events as well. 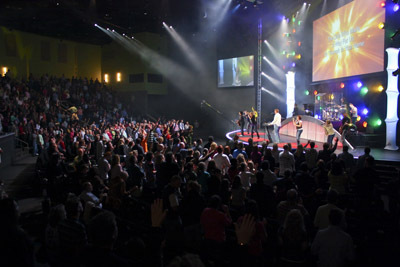 If an event requires turning the youth or children’s ministry spaces into overflow seating, the lighting in those rooms can be controlled from the ETC Ion console running the adult-sanctuary lighting. And in more typical circumstances, those rooms can also be independently controlled via their ETC Unison Paradigm control panels or the ETC SmartFade ML consoles. For more information, please visit www.etcconnect.com.